"the path of least resistance is through a vacuum"
It's been 7 years now since I introduced the SP14 preamp, and now over 450 sold, about 280 kits and 100 assembled by me for customers, and another 70 by Don Sachs. This preamp design has not only meant my expectations but has exceeded them by a strong amount - read the reviews at the bottom of this page!! This preamp is NOT intended for the casual listener. 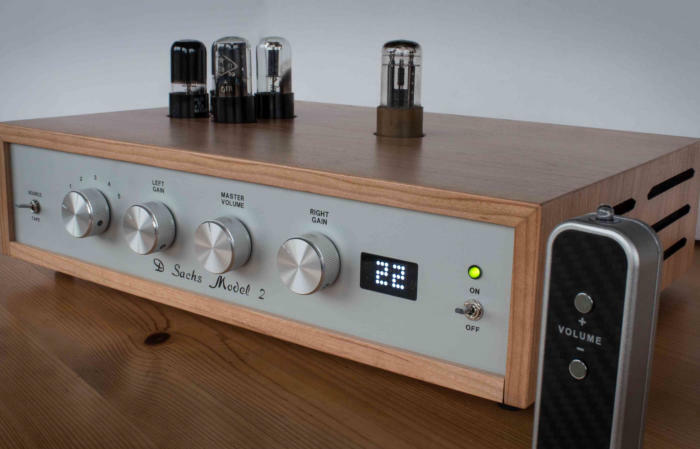 This preamp is for those who are NOT satisfied with a $3000 preamplifier. This preamp IS intended for those DIY builders who may have already experienced my SP12, or who want the best preamplifier kit available at any price. or I can supply it custom built and ready to use. Strong statements? YES! Do I stand behind them? YES! 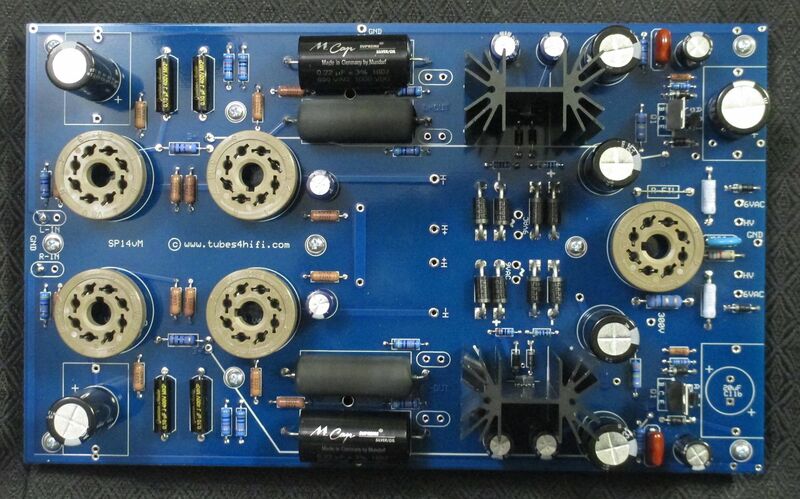 I have been building, testing, evaluating, and designing tube preamps for nearly 30 years. Up until last year, my products were aimed at the DIY builder on a budget. But my customers have been graduating from budget projects, and my better products have been attracting the attention of non-builders who want a super preamp at a super price. manufacturing engineers and production lines, massive marketing and advertising expenses, reserves for spare parts, and reserves for warranty work. Let's get to a description of what makes this a great sounding product. First, start with a great but simple circuit design that has been proven (my SP12 product). 6SN7 is a much better sounding tube than the 12AU7. And because they are no longer as popular as they were 30-40 years ago, their prices are very reasonable for the higher quality tubes. in the supply, and reduces the noise by at least 20db, making for a deep, totally dark background. isolated from the audio signals. For users who have a way to A-B switch inputs on an amplifier, there is an extra set of output connections so that capacitors can be evaluated and compared in real-time. 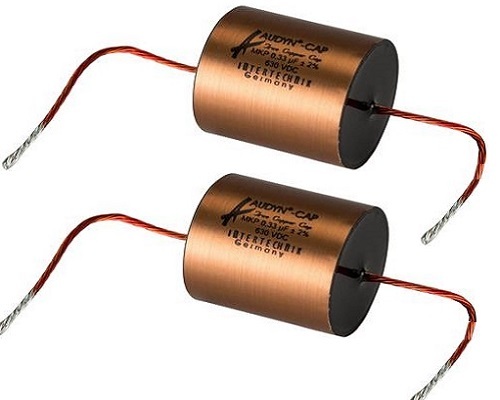 The most popular option are the incredible (and expensive) Mundorf Silver-Oil PIO capacitors. Every customer who has ordered them says they are worth the price! 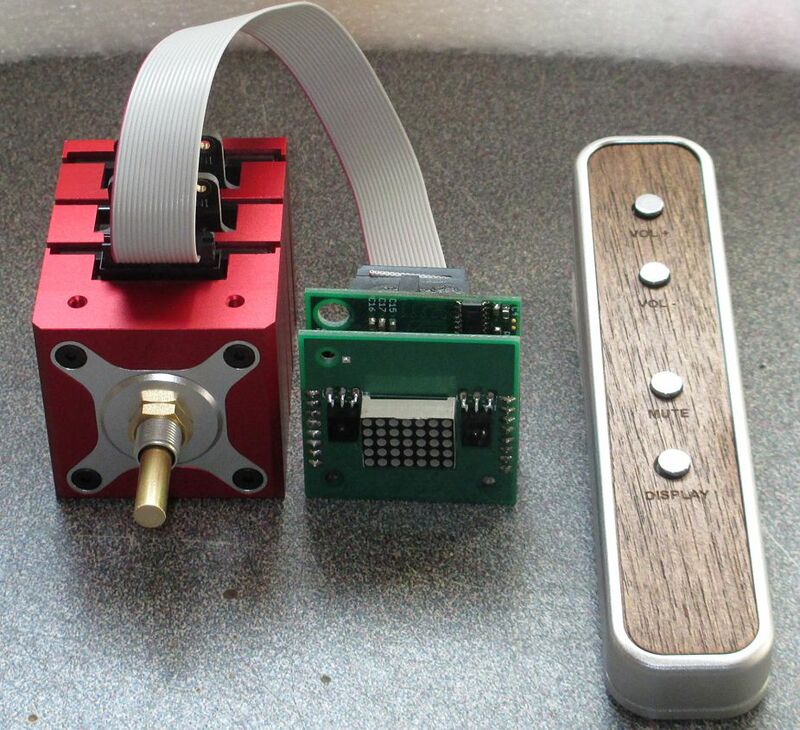 since this is a DIY kit, the preamp can be ordered customized to your specifications. While all of the stock parts provided are better quality, if you want the best, just ask! 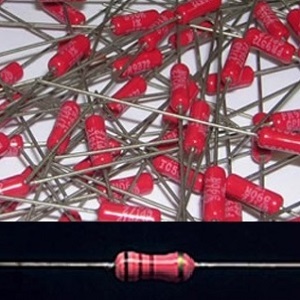 We can supply (or you can buy your own upgrades) upgraded capacitors (Mundorf, Jupiter, Obbligato) and upgraded resistors (PRP, Takman, Shinkoh tantalum, whatever). 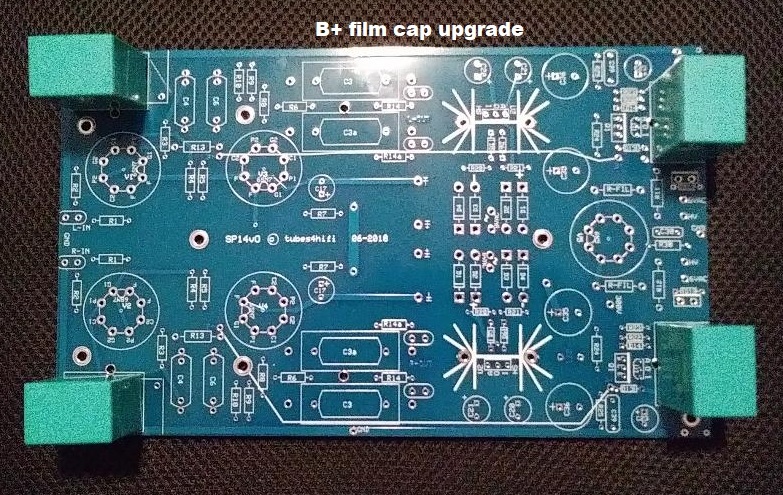 The B+ electrolytics can be replaced with film caps (Audyn or Solen or Mundorf). 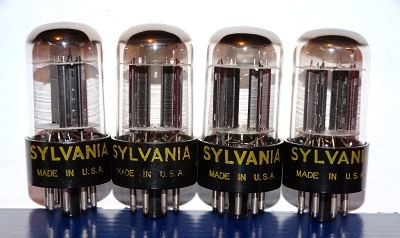 Standard Tungsol tubes can be replaced with old Sylvania "chrome domes" or your choice. Email for a quote on any options or upgrades. Buyers note - this preamp does NOT have a phono preamp section in it - it will NOT fit inside this chassis! here's a custom build by a customer that came out nice! what comes with the kit? here's a list of "chassis parts"
here's a link to the Don Sachs page who builds custom SP14s for premium customers check out HIS reviews! Here's what Don has to say about the preamp . . . This is the finest preamp that I have ever heard! Hi Roy, I sent the quick review below of Don's production version of the VTA-SP14 earlier this week, right after I got it. and now it drives my speakers just dandy. I am totally blown away with how fine this preamp sounds and it is dead quiet, which is unique with the tube preamps I have had over the years. It is completely 3-D in sound presentation and the LF is amazing. Along with my Linkwitz LXmini's, this is finest addition to my audio system ever. Thanks for your great design work and employment of these very fine octal tubes. I hope a lot of music lovers avail themselves of this preamp at a price that punishes the over-priced gear out there. "I got home from work today and the package with the preamp was right where I asked the UPS man to leave it, surprisingly unscathed. that is revealing of music in a way that makes the Dared sound dull and constricted by comparison. The soundstage is immense and 3-D-like. and the bass is deeper and much better controlled. and in addition it is dead quiet, which I could not say about the venerable C-I. It seems more detailed than the C-I and less complicated with only 5 tubes, accessible from the top. While I ought not rush to judgment, I can't help doing so with this preamp as it is so much more detailed and extended than anything I have had in my system, and this is with a $350 amp! the external cross-overs and the Linkwitz speakers. The wood case is very nice as is the silver faceplate, nice to look at and very utilitarian. this is a very affordable and pleasing addition to my system. Every claim you have made about the sound of this octal-tube based preamp is just what I am hearing! here are some reviews of the Don Sachs version of the SP14 from 2016 on the AudioCircle forum . . . This pre tops my most recent units, an ARC LS-25 with full GNSC mods (actually was Steve Huntley's personal piece) and the PrimaLuna Dialogue Premium that I currently own." "Don's preamp is the quite simply the greatest improvement I have ever experienced in my 45 years of listening to my system." "Notes I knew to be there before that barely came through, now sound like I'm four rows back in the center seat at a concert. Right now, it loves anything acoustic. And joy of joy, the SACD version of Dire Straits Mnney for Nothing is mind boggling. I'm hearing things I never heard before." add $60 set of four as shown in photo. Mundorf silver-oil PIO caps added for 2nd pair of outputs, add $95. "sounds better than a Pass Labs X1 preamp that retailed for $5800"
a $5000 preamp for $1490 . . . . Yes, my Vacuum Tube Audio SP14 is a $5000 preamp that I sell for $1490 (assembled/tested/warranty). Here I'm going to tell you how that's possible and why it's such a great bargain (if you didn't already know). I've been meaning to write this for 3-4 years now, but just never got around to it. But now, here it is. My Vacuum Tube Audio business is built around VALUE, not profits. VTA doesn't pay a Chief Executive Officer (CEO) $200,000 a year. VTA doesn't pay a Chief Financial Officer (CFO) $125,000 a year. VTA doesn't pay a VP of Marketing and Sales $125,000 a year. VTA doesn't pay a Director of Human Resources $75,000 a year. VTA doesn't pay for 4 Electronic Engineeers at $75,000 each a year ($300,000). VTA doesn't pay for 20 electronic techs (worker bees) each at $45,000 a year ($900.000). Those figures add up to just over $2 million a year, and those figures are in the ball park for a typical small manufacturing company. I worked for five companies very similar to that during my 30+ year career. A company like that might make 1000 pieces of a $5000 preamp each year, for $3 million in sales. so they are making just under $1 million in gross profit, which is pretty good, around 30%. so now they are probably down  to a profit of around $500,000 or around 17% of sales, right in the ballpark for a decent business. about the same amount of income, so we do OK. I work out of a 100 sf spare bedroom in my home. I work 30-60 hours a week. is an independent contractor who pays himself about a 15% commission on his sales, no cost to me, a fair payment for his work. if you look inside a $5000 preamp you can pretty easily figure the cost. About the same cost as my $1350 preamp. My preamp has $800 worth of parts, $400 worth of labor, and $150 profit for me (about 10%). I can live on that. I don't have any employees (or worker bees). No secretary. Just internet, email, website, buy direct !! I find the best sources for parts, buy in bulk to get some wholesale pricing, and you get the deal - a $5000 preamp for $1350. Maybe later I'll take you inside some of those $5000+ preamps and show you where they cut costs on parts quality. I've seen alot of those preamps using RCA jacks that cost $1 a PAIR. Chassis cost under $100. My RCA jacks cost me $5 a pair, and my chassis costs almost $300. inquire about any other options or modifications you might want via email . . . .